100 Mile House, B.C. – The Gustafsen wildfire, located approximately seven kilometres west of 100 Mile House, continues to rage on. Sparked yesterday, it has grown to 1,200 hectares in size and is growing. One hundred and twenty firefighters, six helicopters, and 15 pieces of heavy equipment have been deployed to fight the blaze along with a 25-person incident management team. 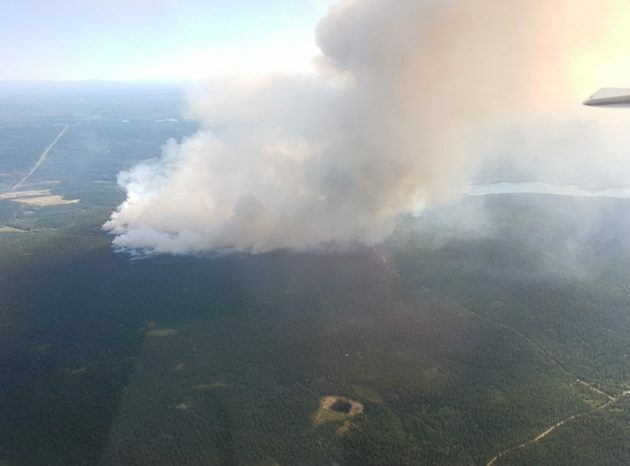 The wildfire has prompted the Cariboo Regional District to issue an evacuation order in the Tatton Station Road area. The order is affecting 33 properties in the area. There have been no reports of injuries or damaged property. An emergency social services reception centre has been set up at the Curling Rink on Airport Road in 100 Mile House.The CRD’s EOC Public Information Line is 250-398-5117.